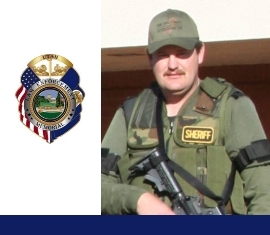 Deputy Brian B. Harris was shot and killed while tracking a burglary suspect in the desert near Fredonia, Arizona. Deputy Harris had begun a foot pursuit of the man in Kane County, but the man fled across the border into Arizona. As Deputy Harris tracked the man’s movements he was ambushed and fatally struck by rifle fire. A large manhunt was initiated during which the suspect exchanged fire with other officers multiple times. The suspect, who was familiar with the desert area, managed to elude officers for several days before being captured. In 2012, he pled guilty to murder charges and is currently incarcerated in Arizona. Deputy Harris is survived by his wife and two daughters. Brian will be missed by so many. A Giant among men. A friend that lived his life in the service of his community. You have been called for a greater service at this time. We will be honoring Deputy Harris and other victims of Utah gun violence at a Vigil to End Gun Violence on Sunday, December 11, 2016 from 7-8 pm at All Saints Episcopal Church in Salt Lake City. Families are welcome to attend.